Gerbera flower can give very high return if planned and maintained well. Here is the complete guide to cultivate Gerbera daisy in India. Discover how to plant Gerbera, protect Gerbera plant from various diseases and harvest Gerbera flowers in scientific way to get maximum market value. Gerbera flowers are cultivated worldwide and are widely popular as ornamental plant. They have beautiful exotic flowers that are of commercial importance. They are used in making bouquets and for flower decorations. Popularly called African Daisy or Gerbera Daisy, the flowers have a huge demand in the market because they can last for a long period of time without losing even a tinge of its freshness. It is this characteristic that has made it so popular in parties, bouquets and functions. Botanically, it is called Gerbera jamesonii as it was discovered by Robert Jameson while exploring the South African region of Barberton. The flowers belong to family Asteraceae. They are herbaceous, perennial plants with brilliantly colored flowers. The flowers have a golden center surrounded by petals such that the petals look like rays. The arrangement is also called ‘ray petals’. The petal color ranges from yellow to orange, red, pink and even purple. Gerbera flowers vary in size from 2.5 to 4 inch diameter. They are held by stems that are 12-18 inch in length. The leaves are coarse and vary in length from 8 to 10 inches. In India, these flowers are widely distributed at altitudes of 1300 to 3200 meters. In other words, they grow well in Himachal, Kashmir and other Himalayan regions but Gerbera daisy can be grown throughout India in greenhouse farming. 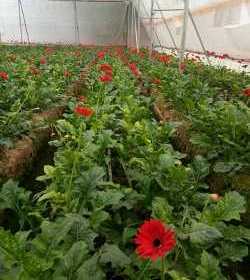 Both tropical and sub-tropical conditions are suitable for Gerbera plantation. However, in case of sub-tropical climate, they must be protected from frost as they are sensitive to frost. Generally, in sub-tropical places they are cultivated in greenhouses. The greenhouses must be naturally ventilated. Light intensity of 400 watts/m² with day temperature in the range of 22-25⁰C and night temperature of 12-16⁰C is the most ideal for producing good quality Gerbera flowers. Gerbera can be planted any time of the year. However farmers generally follow a January- March or June- July cycle. Good light intensity is needed during plantation. Hence plantation is avoided during November and December as sunlight is not bright enough during these months. In addition, there is a possibility of frost development (in sub-tropical region) which is detrimental to the life of the plant in initial stages. Farmers also avoid plantation during the months of August and September. This is because the plants have to sustain winter during their growing periods. Gerbera flower cultivation needs a rich, well-drained soil. The plant roots measure upto 70 cm in length. Therefore the soil must be easily penetrable and highly porous. Better penetration promotes root growth and indirectly plant growth. 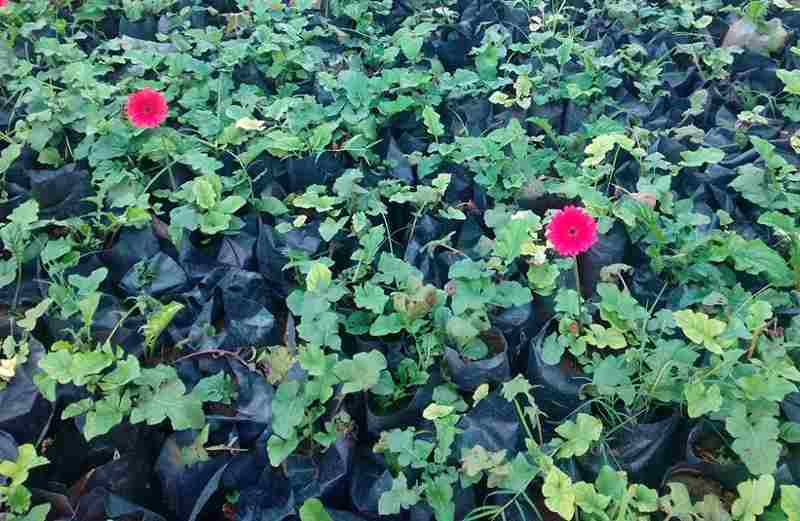 This is an important step in Gerbera plantation. It is necessary to disinfect the soil and sterilize it so as to minimize infestation from pathogens like Fusarium, Phytophthora, Pythium, etc. These pathogens can destroy the crop and cause severe losses. The prepared flower beds must be fumigated with 30 g/m² of methyl bromide or 2% formaldehyde solution. They are then covered with a plastic sheet for 2-3 days. The beds are then thoroughly watered to drain off the chemicals and wash the soil before planting. Soil with neutral pH between 6.5 and 7.5 is preferred. Average water requirements of Gerbera plant is approximately 700 mL water per day. They need regular water supply till the roots are established properly. In other words, they must be irrigated immediately after planting and everyday for a month. It takes a month for the roots to be firmly established. After that irrigation must be done every alternate day. Farmers generally use the drip irrigation method for irrigating the Gerbera fields. Gerbera plants for commercial cultivation are propagated through sucker division and tissue culture techniques. Sucker division is the more commonly used method. During the months of June-July, the propagation is done by division of the clumps. Tissue culture or micro-propagation is another method that is gaining popularity now. In this, plant parts like shoot, flower heads, mid-ribs, capitulum, inflorescence etc. are used as ex-plants and new plants are propagated. Since the soil must be loose to enable deep penetration of roots of Gerbera plant, it must be ploughed at least three times and made into a fine tilth. The soil must be mixed with sand and coconut peat. Farmyard manure must be also added to the soil. Some farmers also add paddy husk. The beds are raised to a height of 30 cm with 1.2 meter width. An inter-plant distance of 30-50 cm must be maintained. Since the soil is disinfected before planting, the beds must be watered well to wash off the chemicals. Nursery plants used for planting must have 4-6 leaves. If tissue culture plants are used then they must be planted firmly into the soil with the crown portion not being buried. This step is very important for good yield and healthy growth of Gerbera plants. Nitrogen, phosphate, potassium in the ratio of 15:10:30 grams/ m² per month from the 4th month or once flowering starts. The above dosage is split into a two week interval. Micronutrients like calcium, boron, copper, magnesium is sprayed at 0.15% once a month to ensure good quality flowers. Raking and loosening the soil around the plant area to allow air circulation. Removing the Gerbera buds that develop within the first two months. Buds produced later must be allowed to flower. Infected plants must be discarded immediately. Roots and crown start rotting. Owing to the root rot, plants begin wilting and they gradually die. 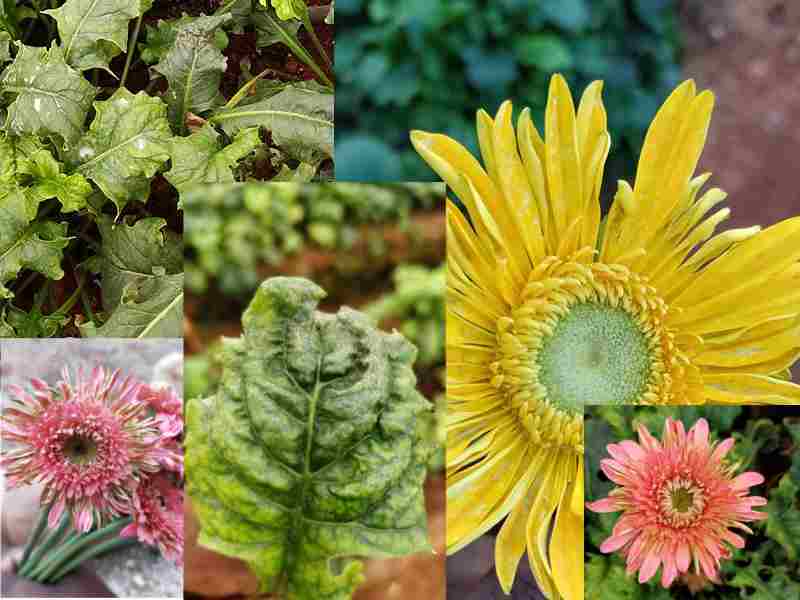 There are different viral diseases like Gerbera mosaic, tobacco rattle, cucumber mosaic virus and necrotic spots. In these cases, the leaves are the first ones to get affected. Yellow necrotic spots appear on the leaf in various patterns like ring, line or flecks. The plants become distorted. The color of the flowers is not uniform. They break at some points. The best way to manage viral diseases in Gerbera plants is to control mites and insects. The infected plants must be destroyed. Normally, Gerbera plants start flowering within three months of planting. However, after planting if the plant bears buds in the first two months, then they are plucked. Buds developing after the first two months are allowed to develop into flowers. They are harvested when the flowers completely bloom. The flowers when in full bloom the outer disc florets are perpendicular to the stalk. He flowers are then harvested and dipped in sodium hypochlorite solution for 5 hours. After harvesting Gerbera flower, the heel of the stalk is cut 2-3 cm above the base. It is then soaked in chlorinated water. Later, they are graded according to size, shade and other categories and packed. 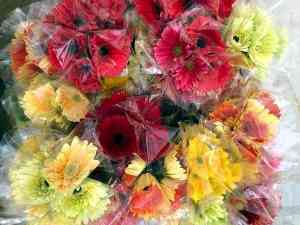 Individual flowers are first packed in poly pouches and they are arranged in rows in cardboard boxes for transportation. If planned and maintained well then Gerbera plant can give very high return as the flower has both the market demand and market value. 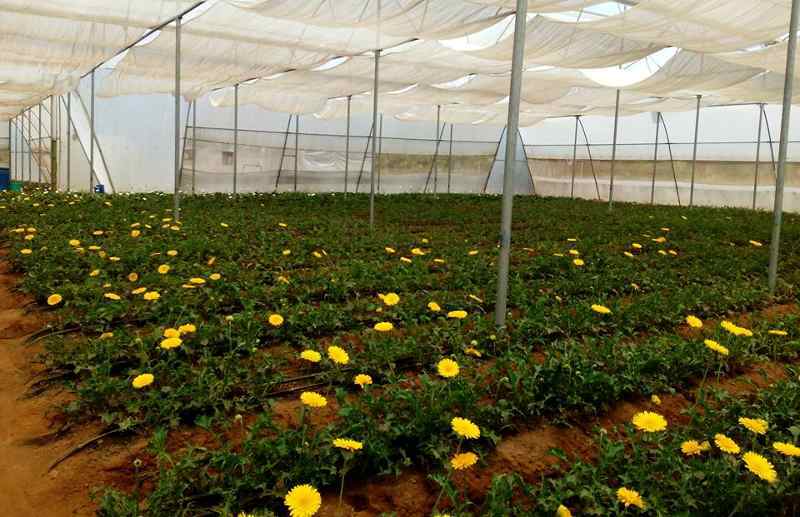 You can opt for greenhouse farming for Gerbera flower cultivation if your farm does not have ideal climatic location for Gerbera flowers. This is very valuable information and very clear on all the stages of the plant. I am interested and looking to start in farming. Hope this is helpful. Thanks for the valued information Dr. Indira.